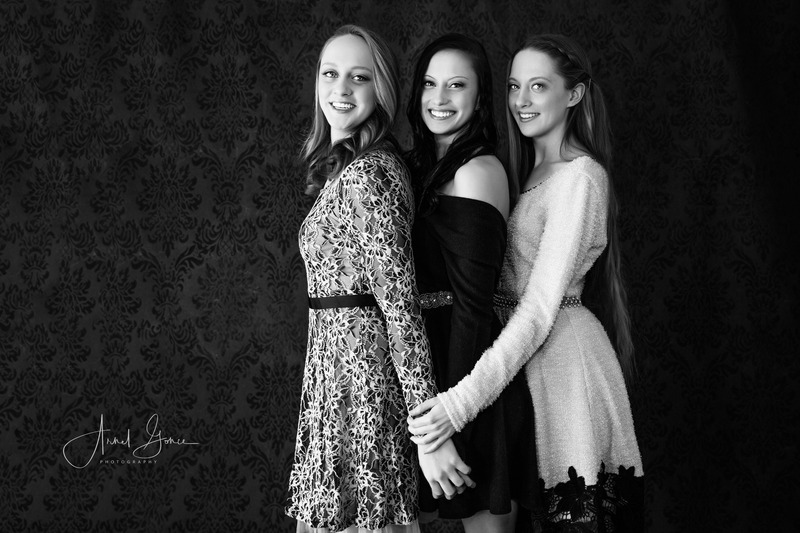 A while back I did a sisters portrait photography session in Charlottesville, as a portfolio building session. One of them wasn’t able to make the shoot, but I’m hoping to be able to be able to get the four of them together in the future for another photography session with all of them. We shot the session in the studio, and used natural light with a speed light for fill. We began the session using the large sliding door for backlit photos first, then switched to side lighting on camera left with fill flash on camera right. As you can see from the pictures, they had a great time! I’ve known the older girls since they were 2, and the youngest since she was born. 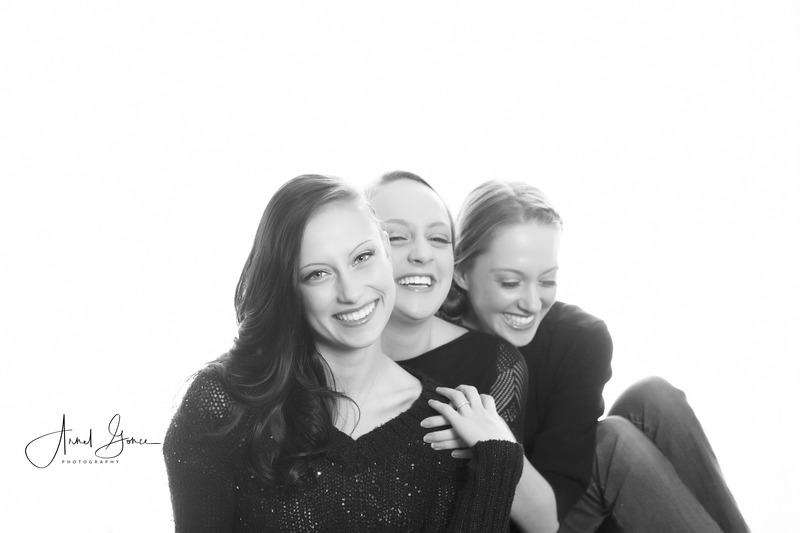 The oldest girls are triplets, and their mom and I used to have great fun taking her three kids and my three kids together (all within 11 months of age) to different places, and what a spectacle it was. The park, the mall, the bookstores, countless trips to McDonalds and that blasted ball pit. What an amazing journey it was, and sometimes the days seemed like the perpetual hamster on the wheel. But suddenly you look up, and the kids are in middle school, then high school, then collage. I suddenly can’t remember how we got from there to here. That time goes by so fast! 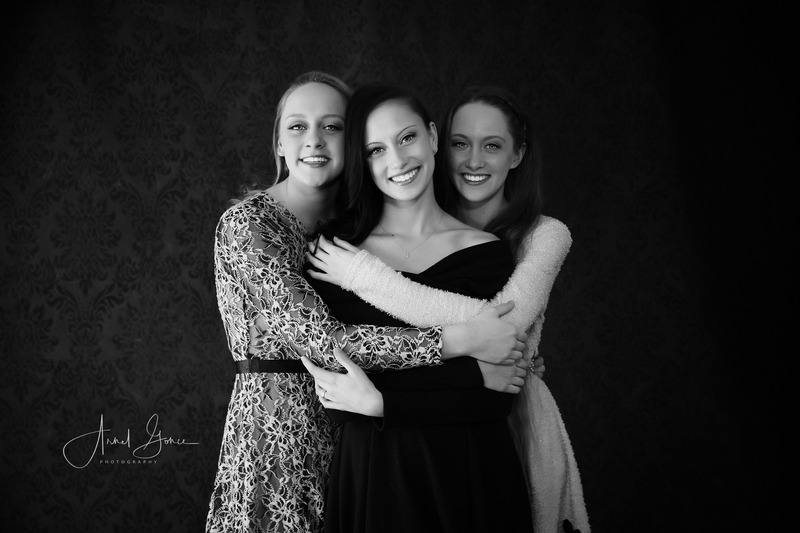 So document your family with a photography session is one of the most important things you can do, because it doesn’t take long before one day you turn around, and yesterday is but a fleeting memory. There’s no hope for a serious photograph! 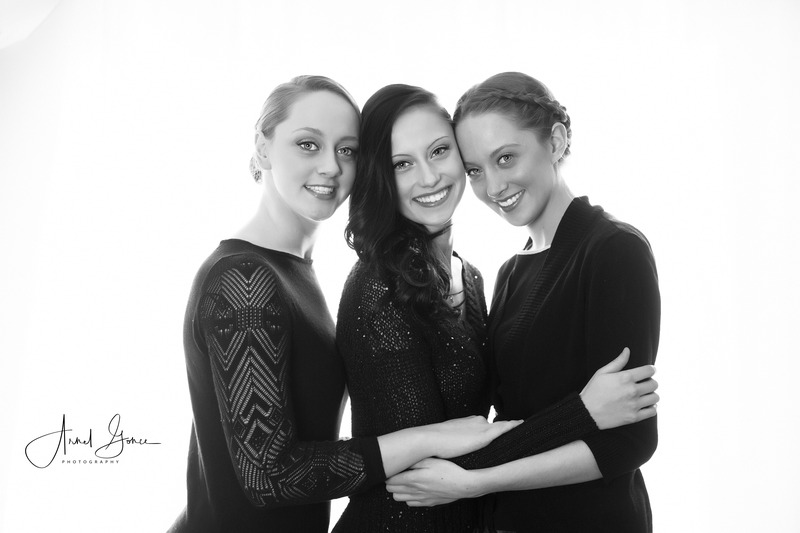 Studio portrait, black and white image, three sisters. 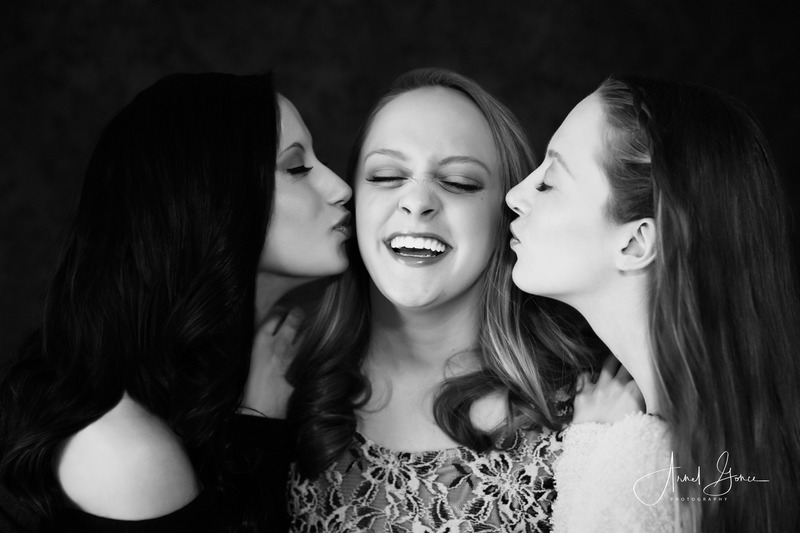 Affection abounds for these three sisters! Piggy back rides at this age are a little harder! Looking up! 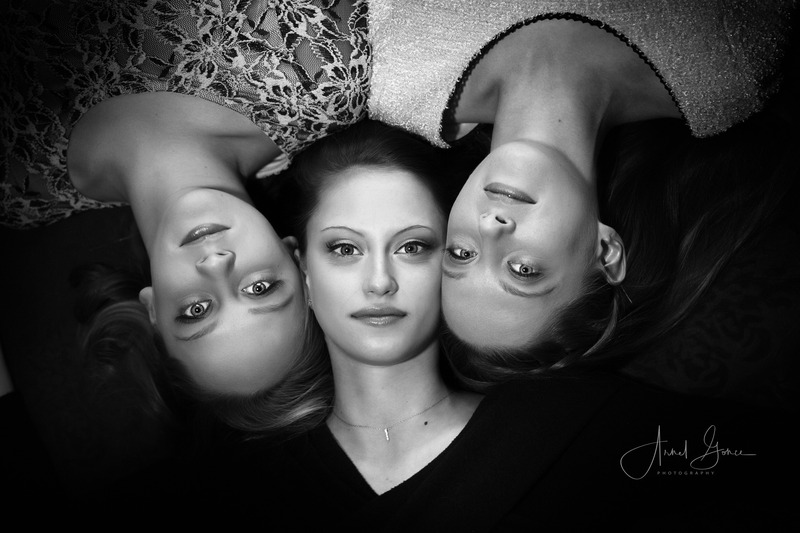 Photographing from above, to a head shot with all three next to each other. 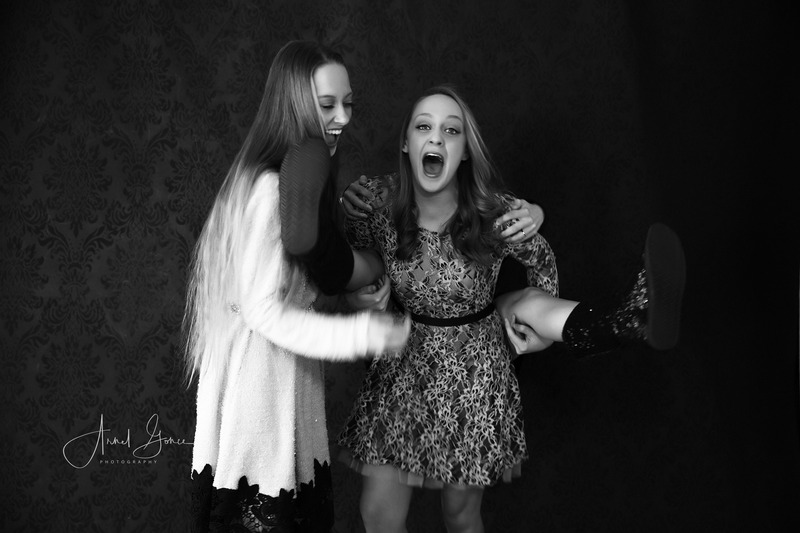 The love of sisters is like no other! Baby sister gets a kiss.